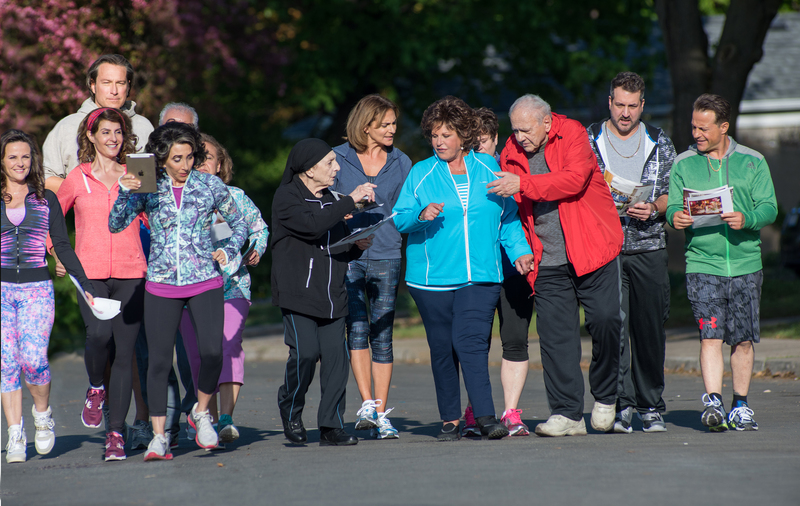 (L to R) Cousin Nikki (GIA CARIDES), Toula (NIA VARDALOS), Ian (JOHN CORBETT), Aunt Voula (ANDREA MARTIN), Uncle Taki (GERRY MENDICINO), Aunt Freida (MARIA VACRATSIS), Mana-Yiayia (BESS MEISLER), Athena (STAVROULA LOGOTHETTIS), Maria (LAINIE KAZAN), Cousin Marianthi (KATHRYN HAGGIS), Gus (MICHAEL CONSTANTINE), Cousin Angelo (JOEY FATONE) and Nick (LOUIS MANDYLOR) return in MY BIG FAT GREEK WEDDING 2. ©Universal Studios. CR: George Kraychyk. HOLLYWOOD—After the phenomenal success of 2002’s international sleeper hit “My Big Fat Greek Wedding,” the pressure was on Nia Vardalos, the star and writer of the Mediterranean-flavored family comedy, to come up with a sequel. But Vardalos, a Canadian of Greek ancestry, wasn’t quite ready to cook up another adventure for the Portokalos family and their extended and boisterous relatives. 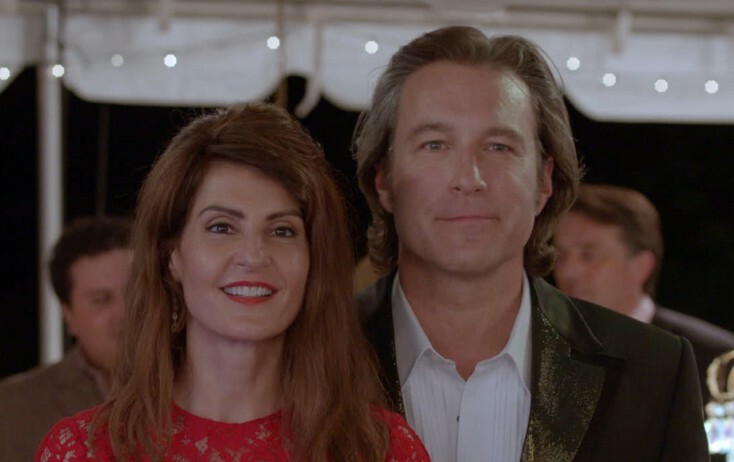 For one thing, the original had wrapped with Greek-American Toula (Vardalos) and her hunky Anglo-American husband Ian Miller (played by John Corbett) enjoying a happily-ever-after as they walked their young daughter to school. After writing and rewriting her script, she presented it to her good friends at Playtone—Tom Hanks and Rita Wilson’s production company—and it was game on. Getting the cast back together wasn’t a problem. Corbett signed on first, followed in short order by Lainie Kazan, Michael Constantine, Andrea Martin, Gia Carides, Louis Mandylor, Joey Fatone and the rest of the original cast. The “Greek” family expanded for the sequel to include Elena Kampouris, who plays Toula and Ian’s daughter, Paris, and John Stamos and Wilson, who play fellow churchgoers. In the sequel, Toula is sandwiched between two generations: her parents, who make awkward discovery about their half-century marriage, and her teenage daughter, who wants to go to prom with a boy at school but also very shy. Reached by phone in New York, Vardalos spoke about the long gestation for “Greek Wedding,” getting the cast back together, becoming a mom in real life and more. Q: What took so long for the sequel to come about? Vardalos: The end of the first movie, I had that wishful thinking moment where I wrote that Ian and Toula were parents. The fact that I wasn’t a mom kept me from doing a sequel because I kept thinking the press tour would be so invasive for me. Q: Congratulations to you and Ian on the (adoption) of your daughter. Q: You play a mom to a 16-year-old girl. How did you find actress Elena Kampouris? Q: You have Greek-Americans Rita Wilson and John Stamos in the cast. How did you get them onboard? Vardalos: John Stamos and I became friends when he approached me outside of a restaurant to compliment by husband’s acting work and I was like, “What a sweet guy!” My husband had gone to get the car and I ran over to the car and said, “John Stamos wants to meet you,” and Ian said, “Why?” I said, “I think he thinks you’re somebody else. Get over here.” And so Ian went over and we became friends. John’s mom had told me how much she loved the movie and had said to me, “If you ever do a sequel, it would mean so much to me if you gave John a role in it,” which of course I would love to. And then she passed away last year, so I decided to just keep the promise. Q: Is it intentional that this film is coming out on Greek Independence Day (March 25)? Vardalos: What a happy coincidence that is! I’ve already been to the U.K. and Australia to bank the press. It opens March 24 and March 25 everywhere. Q: You’re opening against “Batman v Superman: Dawn of Justice.” Is that daunting? Q: Was it tough getting the whole cast back together? Vardalos: I wrote so quietly over a four-year period. While I was promoting my book, I would go back to the script over and over again as I kept thinking of ways to layer-in three generations. Then it was done and it was time for people to read this. I went to Playtone (Tom Hanks and Rita Wilson’s production company that also produced the original) and they said, “It’s John (Corbett’s) birthday. Let’s call him up.” So I called him and asked him if he felt like kissing me again. (She chuckles.) And that was it. We were green lit. I then called two more cast members. By the time we got to the fourth or fifth, they had already told each other. Everybody knew. Q: You guys still look the same as you did in 2002. Vardalos: Thank you. We were lucky that everyone (in the original cast) is still in good health. I was adamant that I wouldn’t wear makeup or moisturizer in the carpool opening shot because that’s how I actually look when I’m taking my daughter to school. It’s not easy to look at but it’s got to be that way. I have a responsibility to parents out there to be authentic. Q: The story tackles the issue of being the “sandwich generation,” where you’re taking care of aging parents and children at the same time. Q: There are other universal subjects families often face that come up within Toula’s circle that audiences can relate to in the sequel. Vardalos: Thanks. In some of the (advance) screenings, audiences detected some of the tiny moments that I layered in to hint that something was coming, but for other people (the surprises) come out of nowhere. I love that because it’s best if it’s a secret kept. Vardalos: I don’t know if I can answer that one because I didn’t write the series, but I felt that the writers did the best they could. I have written for TV and really enjoyed it. Q: Do you like doing film versus TV? Vardalos: No, I love it all. I’m actually adapting a book for an off-Broadway play for next year too. So I just like all the forms. Q: Lainie Kazan has a pivotal role in the sequel. Her character, Maria, has to come to terms with her long relationship with Gus. Few Hollywood films present issues older women face and actresses frequently complain there are few roles in Hollywood for them to choose. Vardalos: In response to the dearth of female roles available to women in Hollywood, I just decided to write very strong female characters as well as strong male characters in this script because the goal is parity. We’re not looking to push men out of films. We’re just saying, “Hey, guess what, we can live side by side with you.” If I’m going to depict a family life, then both genders have to have a good amount of story. It was really joyful for me to be able to write for these strong women like Lainie and Andrea because when they say my lines it’s like a gift. Q: So Lainie liked what you did with her character? Q: Your husband, Ian Gomez, is in the sequel too. Q: You’re up against a big superhero movie (“Batman vs. Superman: Dawn of Justice” on opening weekend. Are you worried? Q: Is there something else that you’re working on now, either acting-wise or producing? Vardalos: I’ve just completed a series that will air on Epix next year opposite Sela Ward and Nick Nolte called “Graves.” I play a political consultant, but I didn’t write it. I got to go back to my roots and act in some excellent material written by Josh Stern. Q: Speaking of politics, you’re Canadian but you’re also now a U.S. citizen. Are you going to vote this year? Q: Do you find the political process interesting here? And how does it differ from Canada? Are you excited about voting? Vardalos: Yes, I’m excited about voting in the U.S. We have a very interesting prime minister in Canada. I find it all very interesting and sometimes really good comedic material. Vardalos: Oh, many times. Yes, we go every summer. Q: Did you witness the Syrian refugee crisis firsthand? Vardalos: Yes. The situation in Europe is humanity at its worst and best. And I’m very proud of the island of Lesbos for stepping up and taking in the refugees. I mean if you see an orange boat coming towards you with these human eyes looking at you needing help, who wouldn’t say, “Yes, please, come to our country?” And I’m not being naïve and saying it’s going to all be okay. It’s going to take a lot of money and a lot of work, but I think it’s really beautiful what’s happening on the island of Lesbos, where ordinary people are helping the refugees. Q: You’ve been an advocate for adoption and even wrote a book called “Instant Mom” about your experience. Vardalos: I try to increase adoption awareness, but I actually consider myself a personal choice advocate because I think it’s people’s God-given right to have a biological child. I’m just trying to spread information about adoption and kind of keep it in the conversation. Q: What has been the outcome of going public with your adoption journey with your book? Vardalos: We donate all the proceeds from the book and my daughter gets to choose where they go. It’s like a feeling of usefulness and connectedness. When you go public with your story, there are drawbacks to it but we see it as such a plus.